How do I create web-optimized thumbnail and medium images using Easy Thumbnails (aka EZ Thumbnail Creator)? Easy Thumbnails is a free application that has been recommended to us by merchants. Features include batch/bulk image resizing, quality adjustment, renaming and more. This program can be downloaded from http://www.fookes.com/easy-thumbnails. The following suggested steps have been included for your convenience. Please note: This is a 3rd party application, is not endorsed or supported by Pulse Commerce and the information is provided as is. Pulse Commerce makes no warranties, expressed or implied. For support regarding this application, please contact the original creator. 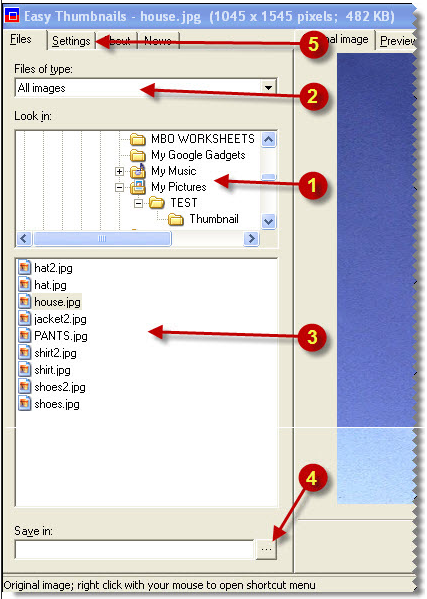 1) Select the folder that contains the images that need to be re-sized. 2) (Optional) use this feature list only a certain file format. 3) Select an image that needs to re-sized. 4) Click this button to select the new image destination. 5) Click here to see more settings. 6) Click the Preview output tab for a preview of what the final image will look like. 8) Set the desired resolution. This program will retain image proportions and will use the highest number from either width or height. 9) Type in the prefix or suffix of the output file name. 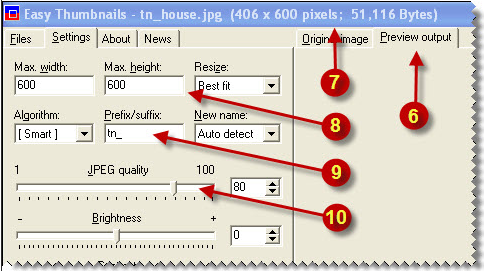 10) (Optional) Adjust the output image quality. Lower quality means smaller file sizes. 11a) Use this button to convert all images in selected folder. 11b) Use this button to convert only the image selected. 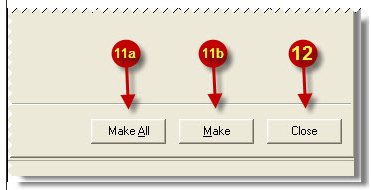 12) This button will close the program.